All of Grayson knew that Wilfred Black, or Wolfleg to his Blackfoot people, died on Vimy Ridge during the First World War. But now, in 1952, a letter arrives on his widow's doorstep. Nearly illegible and stained with the mud of the Western Front, the letter claims he was murdered. Wolfleg's widow wants to let the dead sleep in peace, but Will and his best friend, Arthur, want justice. For help they turn to Arthur's grandpa, a traditional Blackfoot with his own ways of seeking the truth. The terrifying reality of war that the boys experience in the sweat lodge nearly spells the end of Will. In Across the Steel River and A Dirty Deed, Will and Arthur uncovered hypocrisy and attempted murder in Grayson. This time, the violent reckoning they set in motion threatens to tear apart their town -- and their friendship. About Ted Stenhouse (Author) : Ted Stenhouse is a published author of children's books and young adult books. 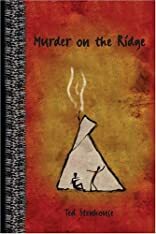 Some of the published credits of Ted Stenhouse include Murder on the Ridge, A Dirty Deed.